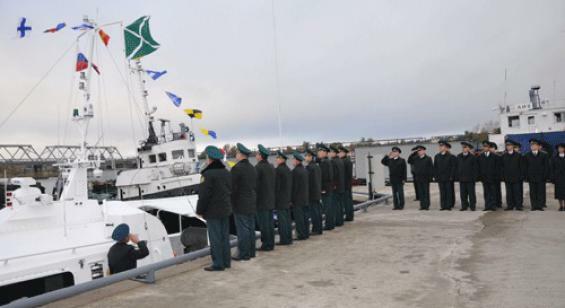 Last week, marine Kingisepp customs office has received a new , equipped with the latest technology and weaponry average customs vessel TS- 532, a flagpole which was solemnly raised the flag of the Federal Customs Service. A seguito di operazioni di ricerca condotte da dipendenti Sebezh dogana , insieme al canale ingresso nel territorio dell'Unione doganale attraverso MAPP veicoli Burachki in violazione delle leggi applicabili . Kirghizistan cittadino , che costituiscono il sistema penale, ha organizzato l'importazione di autovetture in Lettonia attraverso MAPP Burachki Sebezh doganale. Comunque, la registrazione e il lavoro di ufficio in ufficio non è esercitata nel loro nome , e candidati - i cittadini dei paesi limitrofi . According to the expert of the Ministry of Finance of the Russian Federation Alexander Sakovich , the average price monitoring for the period 15 August to 14 September was 113.41524 per barrel, or 827.9 dollars per ton. Thus, the Russian government is likely to set the fee at 416.4 dollars per ton , based on the rate of duty on the basis of the coefficient of 0.6. Reduced rate for oil in Eastern Siberia and the Caspian fields Prirazlomnoe be from October 1, 208.3 against the dollar at the current rate of 196.5 per ton . "Alfa Ust-Luga" entered into a contract with the company "Leroy Merlin Vostok"
June 28, 2013 signed a long-term contract with the company "Leroy Merlin Vostok". We are waiting for the first containers at Ust-Luga Container Terminal (ULCT). We will keep our readers informed of developments! June 20, 2013 "Alfa Ust-Luga" was produced first customs clearance of the first container with spare parts Honda in "Ust-Luga", which will be held on a regular basis. Alpha Ust-Luga LLC will take part in the largest International Exhibition for Transport and Logistics TransRussia-2013, which will be held in the Moscow Exhibition Center from 23 to 26 April 2013. We will be glad to welcome partners and customers at our exhibit booth located at Pavillion 75B (booth № B321). Leading experts of Alpha Ust-Luga LLC will provide you with the information about wide range of services and answer all sorts of questions. “Alpha Ust-Luga” LLC takes part in the VIII International Exhibition of forwarding, customs services, transport, and logistics, “Customs North-West 2012”. The event takes place on May 23-24 in “ExpoForum” exhibition centre. We will be glad to welcome you at our stand located in the 6-th pavilion, ground floor.